Look out world here we come ! So much has happened since our last post ! Since the last blog ,we have been to Haiti and back (Nov. 2015- Dec.2015 ) and once again we are preparing for our next trip in March 2016 ! Our trip before Christmas was once again amazing! You would be just as proud as I am to see how beautiful our school is looking. There are multiple classrooms and as you walk past the rooms you can hear the laughter of the children and the busyness of them learning ! There is a cafeteria where they go to eat their lunch and as they play at recess, there is a place where they can help themselves to clean filtered water. 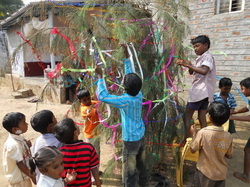 The children all have clothes and most of them have received a nice brand new green uniform to wear to school. Plants line the borders of the outside of the school and most are edible. 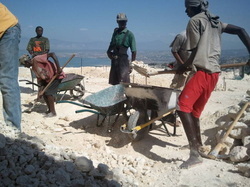 The men were working very hard in getting a special room made that over looks the mountain. It is coming along beautifully and is going to be used as a library as well as a place for the elderly and adults to have Bible Study and as a place to just get together. Our True Love Mission Church has a fresh coat of paint and looks great. The morale of the children and adults is so different than when we first began. There was testimony after testimony from the people sharing about how their lives have changed. Esther's mom, Sang joined me on this trip to Haiti and was truly a blessing . The people loved her as soon as they met her. The children were drawn to her and it seemed like there always was a little hand with in hers. We took two trucks filled with people from the church down to the water and were blessed to have had the honor to baptize 7 people. This is always my most favorite thing to do while I am in Haiti. The presence of Holy Spirit is felt so strong. I love being part of His plan in all this !!! We also gave out what seems like tons of clothes , food and toiletries as well as many other goodies as we emptied the 14 barrels that we sent down. Thank you to all of you who faithfully give and help pack out those barrels. I could go on and on but I want to tell you about another great door God has opened .... we went to Lusaka, Zambia, at the end of June 2015. And oh my gosh !!! I love these people ! God always amazes me. The way He brings people together and the way we begin to see the plan He has for us is so beautiful. True Love Missions was able to to start doing missionary work within two hours of landing In Lusaka. And this is only the beginning !!! God is doing a new thing ! And we love it ! Haiti is where it all began and it is only getting better, but God is opening many many doors for us to share His love throughout the world !!! And so a new journey is beginning !!! TYJ !!!! Updates !!!! Hi everyone ! I pray you all are well ! My last trip to Haiti was once again amazing ! As soon as I got off the plane we were at it ! Busy making our plans, opening my barrels that were waiting for me and trying to figure out how to squeeze in as much as we could for that week. We immediately were putting together hundreds of care packages, giving out clothes, food, toiletries, etc. Thanks so much to Sue Fitzpatrick of the Long Island Running Club ! She donated enough brand new hot pink t-shirts so that everyone in our village got one! Everywhere we went... men, women, and even some young ones were in them. It was great. The day after I arrived we had a big get together in Jean's courtyard with a whole lot of people from up our mountain. There was food and jice for everyone as well as goodies for them to take back. We danced, we prayed, we worshiped, we laughed, we cried, we hugged, and we tahnked Jesus for making a way to bring us back togehter. It was a beautiful day and then we did it againthe day before I left. That day there were hundreds of people. It was another joy filled day! As all this was going on, there was one truck after another bringing our sand, rocks, and all our supplies needed to start our new school for the children and the adults. How the truck makes it up the mountain and through our gate without tipping over is a miracle. Every time I saw them coming, prayers were being lifted up!!!! As soon as the trucks dumped everythig out, everyone runs to help, bare handed and some barefooted. Its so nice to see. Anyway the school is coming along beautifully. I have attached some pics for you to see. I can't wait to see it when I go back March 28th 2015. A few things we did.... we wanted to visit Madame Francios because it has been too hard for her to come down the mountian. She hasn't been able to make it even down to the church and we all know that has been bothering her, so we decided to take the church to her!We got everyone to suprise her! We carried the drums, tamberines, all the coal and everything we needed to have church there. It was quite a sight ... a trail of us winding through the brush and going up even higher up that mountain carrying all this in that heat! But yet I wouldn't have traded it for anything! I had brought long sticks from back home so we roasted hot dogs over the coals. It was another awesome day. Madame Francios was glowing. It was so nice to see them all hugging each other and before we left, she shared her testimony of Gods faithfulness in her life. It was precious. On the way to her hut, I was able to give out some more of the beautiful dolls that The Giving Doll has been making for the children. To see the kids come out of their huts/tents,and hand them one of these dolls is the best thing ever. Their smiles are priceless ! They have never had anything like it. No toys anf now a beautiful handmade doll. They just cling to their doll with the biggest smiles ever.... barefooted, dirty, and often half naked. I could go on and on cause this is only a little piece of what we did but I think you get the idea. I just wanted to update you. I also want to say THANK YOU !!!!!!! You are truly an answer to prayer. None of this could be possible without your help, support, and prayers. Each and everyone of you are part of this in one way or another. You go with me. You will never truly understand how much of a difference you have made in these peoples lives. Every time I go, they share more and more stories on how their lives have changed. The common thread in is that they all say the same thing, "Since you have been coming to Haiti, we have hope. God has given us hope. " Bryan and I returned from Haiti a couple of weeks ago. time putting their hand prints on the outside of the church in red, green and yellow paint! Hands to work and hearts to God ! What an answer to prayer. I remember when we were under the tarp down the hill having church and no where for the children to go to school. We looked up to the mountain and dreamed and prayed that God would open the door for us to build something safe, secure, and be that light on the mountain to all of Haiti and He did ! Now we are in the middle of clearing more of the mountain to make the school and church separate. we built the retaining wall and laid concrete so that when it rains, the mud wont keep washing things away and make a mess. 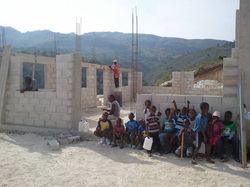 We are praying for funds to come in so that we can get the school built. We are doing more and more medical things as well. We were blessed by Dianna and Peter who have such big hearts for Haiti.Its because of them that we were able to bring 18 people to the eye doctor. 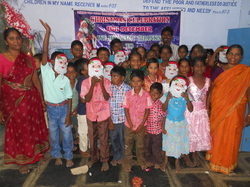 Fourteen of them received eye glasses. One is being treated for glaucoma, another cataracts, and multiple people were found to have high blood pressure and now are on medication. One persons pressure was 226/116. Thats truly a miracle of Gods timing because she was headed for a stroke. Most of theses people have never been to a doctor before in their life. We went through the village and way up the mountain and gave out bags of food to 27 people/ families with enough food to last two to three weeks(thanks to Rickles from HSW). We fed the village everyday we were there. We gave out flashlights, batteries, soap, toothpaste and brushes, clothes, diapers, 226 T- Shirts, (donated by Smithtown Gospel Tabernacle), 148 cross necklaces, (donated by John and Fran Pangal), Plastic tubs filled with tylenol, neosporin, bandaids, tissues, deoderant, hand sanitizer,tic tacs, etc, (donated by Blake Topper). 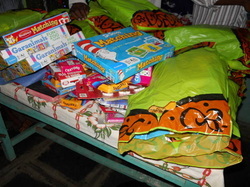 Dresses, childrens clothes, baby clothes, hair clips (donated by Mary,Mike Alcazars grandma and his mom). Many many baby items (donated by HSW Spanish club) as well as sneakers, shoes, and backpacks from HSW students and staff. Denise Winters supplied all the canvas bags that we put the food and the other goodies in to hand out. The list goes on and on. I can not thank you all enough for your prayers and donations of all sorts. You help to make it possible for us to do what we do. Besides all the great things we were able to do for the people, this time they did something special for us. They wrote a letter on behalf of all of them to us. Every time I think of it I cry. It was beautiful. Their words more precious than gold. They also shared testimonies on how God has used us to change their lives. They once again touched our hearts. I love these people so much. They have nothing but they give all. 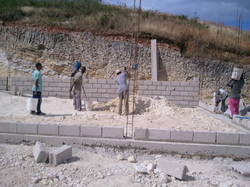 Building of the NEW CHURCH !!!!!!! Bryan was in Bizoton, Haiti from December 17, 2011 through January 7,2012. After much prayer, he knew that God wanted him to be there to over see the breaking of ground of the New Church that we are building, slightly up the mountain from tent city where the old one was. When he went down there we knew that this was going to be a new thing but the extent of the true meaning of "NEW" became more apparent as each day unfolded. It seems that many people who were attending the old church had left, not feeling very welcome. Bryan came to find out that many of the churches in Haiti follow alot of the "religious traditions" of the Old Testament and not the love of Jesus! They read from the French bible because that is what they regard as "correct & proper" but most of the people from the villages only understand Creole. One woman was kicked out of her church because they felt she had cut her hair too short and they considered that disrespectful. Ground breaking of The New Church began on Christmas Eve! What a beautiful day to start something new! As they were getting ready to celebrate the day of our Saviors birth, the New Covenant of Jesus Christ, the ground for the church was broken. And in as much as Jesus was broken for us, for our sins, this New Church of Jesus is going to be used to break the chains of darkness and vodoo that has ensnared these precious people for so long. It is going to be used to set the captives free in Haiti from all their traditions and religious practices. One by one, we believe that they will come to know the truth about Jesus and that they will feel His love like never before! That they will come to the saving knowledge of grace that only comes from Jesus! As the foundation of the church in the physical was being laid down, so was the foundation of the New Church of Jesus being laid down in the spiritual. God put many things on Bryans heart. Bryan began to share the real Jesus! He began to tell them about Jesus's love and about how special they are. He told them about how Jesus died for them so that they might have life. He shared about how when Jesus came there was a new covenant established in Him, making the old obsolete. As he spoke something began to happen. The words started to penetrate their hearts. One by one Bryan could see something come over each one. It was like their eyes and ears were being opened. Suddenly the expressions on their faces and the posture of their bodies began to change. They started to sit up and listen with smiles on their faces. It was if God was touching them one by one and they were feeling it for the first time! They started to hear truth about Jesus! The Jesus they had known was very harsh and judgemental. They did not know of this Jesus who said "Come to Me, all you who labor and are heavy laden, and I will give you rest. Take My yoke upon you and learn from Me, for I am gentle and lowly in heart, and you will find rest for your souls. For My yoke is easy and My burden light." That woman who lives way up the mountain heard about what was being spoken at this "New Church" and walked a long way with her daughter to hear about this Jesus who would love her even if her hair was short! God used Bryan those three weeks in a miraculous way! What started with a few people the first time Bryan spoke the truth, grew to about 60 the last day he was there. Word has been spreading throughout the villages. People who never went to church because they didnt feel they belonged, now went to church! From what we hear.... many ,many, more will be there when we go back in Feb. 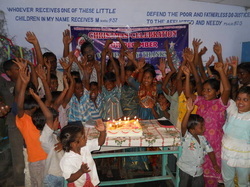 They are hungry not only for physical food, but for the Word of God! Please continue to keep them and us in prayer as we prepare to go back in three more weeks to share more about how awesome our God is. May your will be done Jesus, in this New Church, on earth as it is in heaven! Freedom is found in Jesus! He and He alone sets us free as we draw near to Him! We thank Him for all He has done and for taking our hearts and weaving them together as one body. 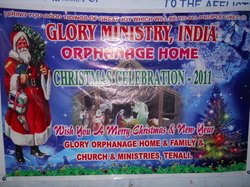 Recently we received pictures from Pastor Ram of India of the Christmas party they had at the orphanage. They are so touching and we wanted to share them withyou! Its such a blessing to be able to bring some joy and happiness to these beautiful children and to spread the love of Jesus! Please see our previous blog from Pastor Ram ! And a very special thankyou to Gina Kearney of Ohio for joining with us to make this Christmas for the orphanage a blessed one!